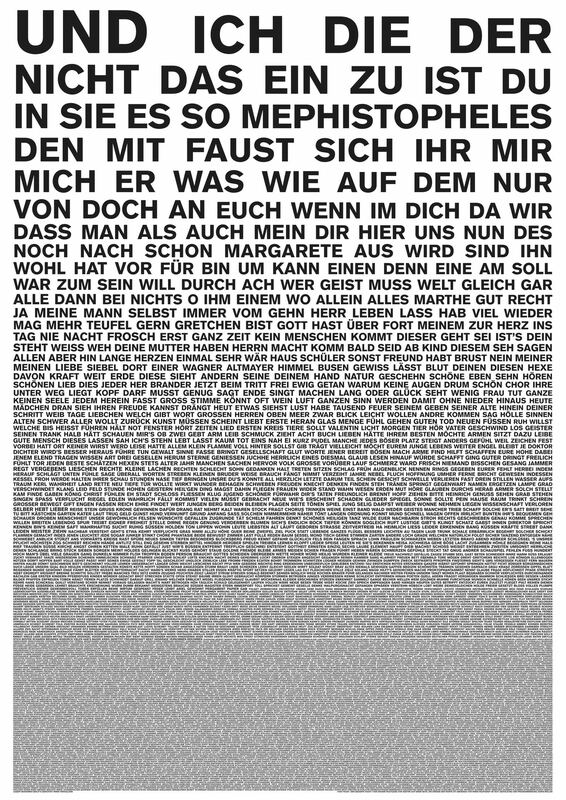 The poster Fast Faust contains the entire text of the play Faust by Johann Wolfgang Goethe. Every word of the play is represented here, only the visualization has changed. Words that occur more than once in the play are displayed larger. So the size of a word depends in its frequency in the text. The most common word und (eng. : and) occurs 918 times and is thereby the largest word on the poster. It is hardly possible to translate the frequency directly into the point-size, so a logarithmic scaling was chosen for the visualisation. Fast Faust reveals the most common words and provides an overview of how many words Goethe used in the Faust altogether. As it is german literature we are talking about, the most frequent nouns are Geist (mind / spirit) and Welt (world).